What to do with that okra? Well, you must never serve it just boiled to death in its own slime like all the southern mothers did, and while we all like it fried, we all like just about anything fried and we’re over that now. So what does that leave? Well, grandmother couldn’t do this, but a wonderful way to cook okra (especially the more tender pods) is to wash it and arrange it while it’s still wet on a plate points in, slip the plate carefully into a plastic bag, and microwave for several minutes. It is soooo fast and soooo delicious and, since it needs only a bit of salt and pepper, so good for you. I used to do this at the office, and the Indian programmers gathered around like it was popcorn. But you have to actually like okra to begin with if you’re going to eat it this way. What we need to do with okra is present it in a way that most folks have not experienced so as to do an end run around the preconceptions. Here’s a method I figured out, one that borrows shamelessly from both the Indian and the Southern cuisines. Put on a pot of water to boil… for peeling the tomatoes. Peel and roughly chop a good-size onion, a half pound or so. Peel and roughly chop half a head of garlic. Wash and drain a pound of okra. (Optionally) chop a couple or three seeded jalapeños or New Mexico chiles. Blanch, peel, and chop a pound of tomatoes, making no effort to juice and seed them. Stem and neatly chop the okra into one-inch pieces. On good days I can get much of the okra prepped before the water boils for blanching the tomatoes. In a skillet, get three or four tablespoons of oil hot and throw in the okra. Once it’s got going, throw in the chiles.. After a minute or so, throw in the onion and after another minute, the garlic. Continue sautéing until the onion is “sweated” but not really cooked yet. Throw in the tomato and juices. Stir occasionally over med-high heat. There will be no “sauce” at all at first, but the tomatoes will rapidly render some out. As soon as the tomato chunks have mostly dissolved, it’s done. A few smaller chunks of tomato is fine, but you do not want to cook much beyond this point to prevent the okra from overcooking. Here’s a pot i did into which i experimented with using twice as much tomato. 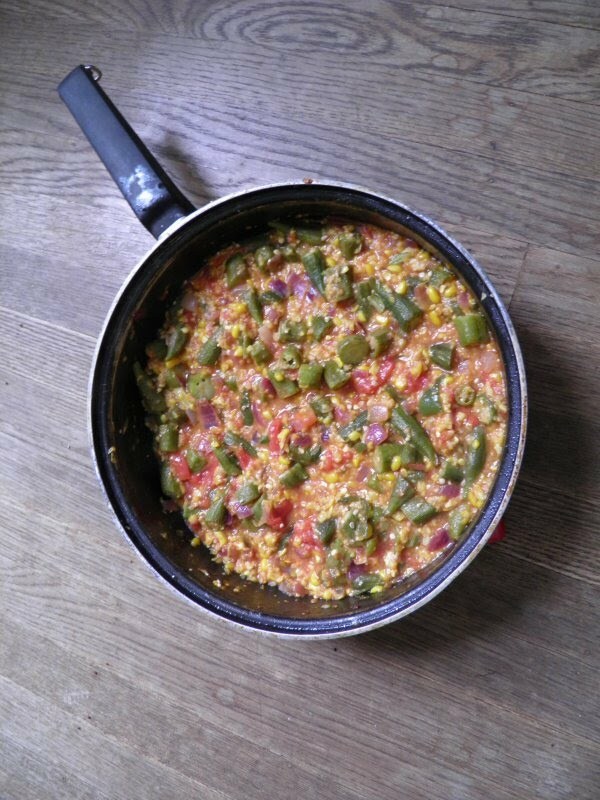 It was good, but the extra tomato rendered out so much liquid that by the time i’d boiled away the excess, the okra had overcooked. A dab of Patak’s hot curry paste or their hot lime relish adds excitement and reminds us that we’re not really sure whether the Indians or the Africans had okra first. An excellent addition in high summer is to throw your patent corn kernel stripper over the pot a couple or three minutes before it’s done and grate two or three ears of fresh yellow corn into the dish. Great combination. And finally, in August 2010 my friend Charmazel was visiting and i was going to cook this for her, but before i could really get going with it, she had some input. Well, i had to listen to her since she was born in Allahabad and thus genetically has a head start of several millennia in okra expertise over my Scots-Irish ancestors. The first change she made was in cutting the okra. In Christian countries, you cut the okra into 3/4 or 1 inch pieces. Not so in countries that enjoy an abundance of servants who can be relied on to chop the okra in 1/4 inch disks. Serving suggestion: Top each serving with a generous dollop of quark or skyr.